I haven’t met a fish tail I didn’t like. Or couldn’t eat. Don’t get me wrong though, it hasn’t been all fun and games. Not especially on that Monday afternoon, decked in a white top and sky blue dress, ready to wow my audience at the afternoon meeting. All this without properly consulting my fish tail. And then, ‘bam’, a piece of smoke-cooked fish, blanketed in bright orange palm oil sauce proceeds to land on my top. My white top. Fish tail, Fish tail, what’s not to love? ‘Ha, gotcha’, it thought but it was I…who had gotten it! See, a few minutes before I sat down to ‘wack’ (eat, in Nigerian parlance) with washed hands, I had all the necessities corralled by my side – roll of tissue paper, plastic blue bottle of cold water with tiny bubbles of condensation beginning to gather, creating a tiny pool of water on my ‘pine’ table. Also, I’d gently extricated my warm self from my peach shawl which kept me snug…and helped ward off the ‘air-conditioned’ cold. I was certain I would stain it. And then I debated with myself – let the shawl get stained, or remove the protection and take a risk with the clothes? I did the latter, confident that if at all the clothes soiled themselves (with no help from me whatsoever), there would be a blanket to cover up the crime. And predictor of success and failure that I am, all I desired thought about came to pass. A piece of fish landed on my white top. Was retrieved and properly managed aka eaten. I smile. 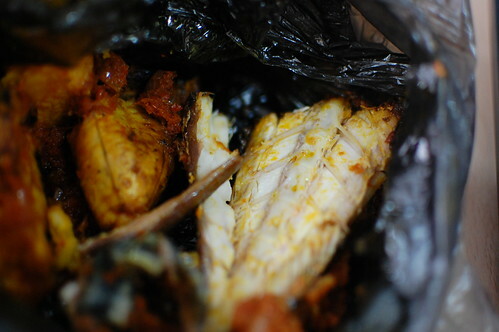 And tuck in to my lunch of Bole (pronounced like ‘ball’ with an e or i at the end) and Fish. Roasted Plantains and Mackerel. My lunch that cost me two hundred and twenty naira ($1.50/ less than €1). 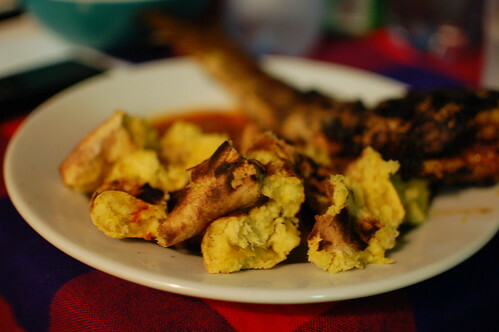 For that amount, I got a whole ‘just-ripe’ plantain, five small pieces of yam, roasted; a long, delicious fish tail and some peppery sauce. More lunch to be honest than I could eat in one go! Most days, I take my own lunch in but on the occasions I don’t, I worry not as good, (street) food is in plentiful supply. Sometimes, I get my lunch myself and other times, a couple of colleagues are so kind as to go get lunch for us all. (We pay, they buy). The first lunch time order I put in, garnered laughter in our open plan office. See a lot of my Nigerian friends and colleagues tease me about my ‘western ways’ – my love for Spring gets rewarded with ‘there’s only rainy season in Nigeria, no spring’…..Some suggestions I make are brushed off as being too ‘foreign’ but I persist. And nowadays, I say to them ‘You’re just jealous’, when they start turning up eyes and nostrils at me! 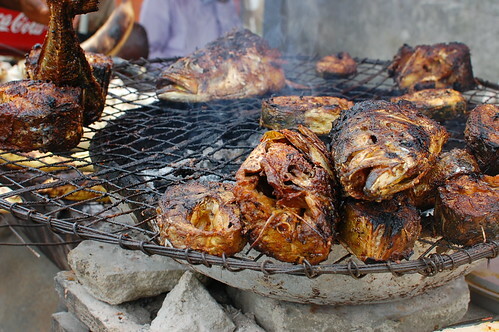 And so when the boys return from their afternoon outing to buy ‘bole and fish’, I get ribbed. Hard. ‘Don’t give her any, except you sign a medical note’. What they mean is my stomach, with 4 years of eating ‘European/Western food’ has become delicate and unable to stomach the oil and spice, thus I might have to see a doctor. ‘Imagine that’, I say, sneering…my bottom lip pursed together and raised up to meet the upper, with a slight hiss. ‘You guys are not serious’. If they knew that for the four years I was away I didn’t abandon the motherland, they would retract their statements. They would think again if they knew that my deep freezer always had blackened, dusty discs of iru (known as one of the World’s 12 smelliest foods), for my soups, pressed together like the flattened skin of an alligator and smelly like its fresh counterpart of locust beans. And crayfish and spices. You don’t get more traditional Nigerian than that. But they don’t know, and I’m too busy settling down to tell them. 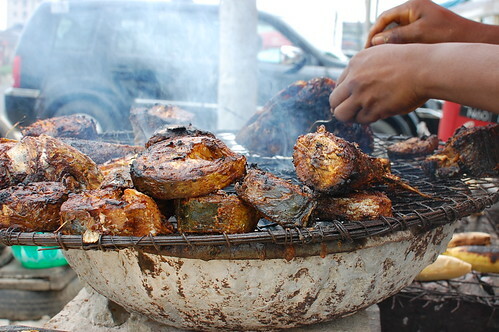 Bole and fish is quintessential Nigerian street food. Like Suya. 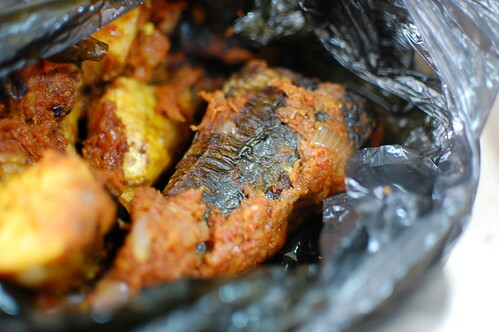 The Bole refers to ‘roasted’ plantains and the fish is almost always ‘affordable and plentiful’ Mackerel. 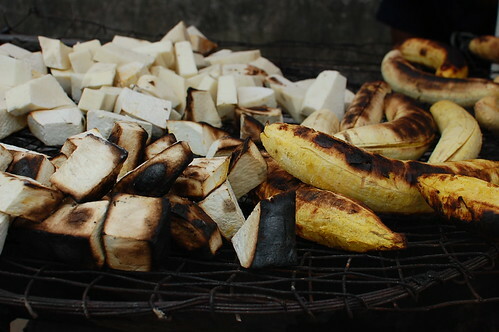 In the West of Nigeria, roasted plantains are a snack, paired with peanuts (known as groundnuts) and sold sauceless. Bole and Epa (Plantain and Groundnut). But in the South…..roasted plantains are a meal. Rarely made at home. Best purchased on a street corner where wizened old and young women, sit beside blackened bowls with fingers of lead, facing red hot coals. Where plantains, green and yellow say their last rites, and mackerel segments itself. Where sweet hot sauce, orange with palm oil and reddened with spice makes happiness its home. And where every and anyone is free to cart off a ‘black’ plastic bag full of lunch. Capable and efficient hands. Hands of steel, or lead? It is simple, the fish is glazed with spiced palm oil before roasting and the plantains and yams go on grill sans any dressings. Roasting commences while a huge pot of fried ‘special’ sauce, made with lots of onions and peppers stays warm. To the side. If balance is important to you, you may observe the shredded Uziza leaves, worshipped by some for its bitterness. But not me. This is a point and choose game. You request for a ripe plantain, and watch with hawk’s eyes, as the lady selects one….and then you say. ‘No, not that one’. 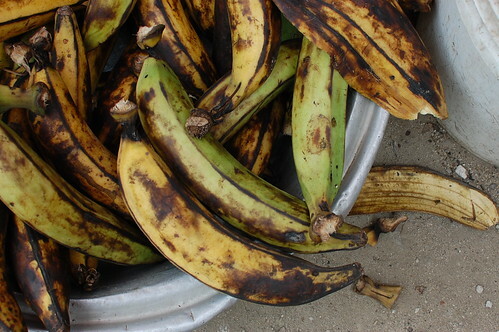 You point to the fattened, yellow-ripe plantain, burnt and burnished bits smiling at you. Welcoming you. You say, ‘abeg, gimme this one’. Please, give me this one. Please can I have this one. She picks it up, or her helper does. Whoever it is cleans up the plantain or the pieces of yam– they remove the really burnt bits, scraping with a knife and getting it ready for you. 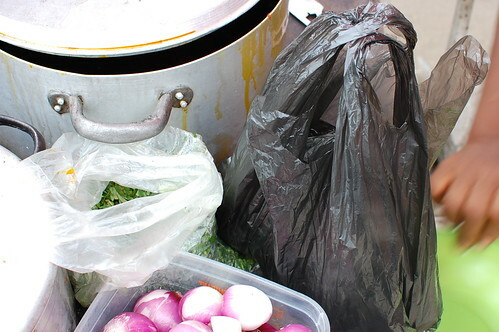 A small black plastic bag is set aside for – the Nigerian equivalent of a brown paper bag. Or a plate if you’re eating ‘in’. And the layering begins. In and on go the plantains, torn into small pieces. 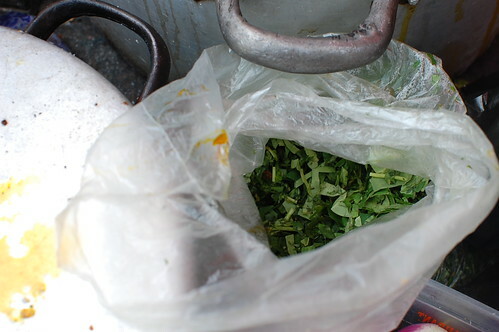 If yams are to follow, they are crushed lightly by the tightening of the fist, and then sauce is ladled over the top. Did I forget the fish? Head, middle or tail? The choice is yours. No fish? That’s also acceptable, if questionable????? Fish goes in, more sauce. Some people say ‘no put plenty oil o’….imploring the lady to serve up the sauce and not so much of the tasty oil. This could be the final touch, Except if you like some greenery and garnish in the aforementioned bitter, Uziza leaves which I personally can do without. You pay and that’s it. Deed done. You either stroll off, bag in hand or you sit down on a wooden bench, shaded by a red umbrella, eating out of an aluminum plate and enjoying the whizz of taxis and the buzz of street conversations. I’ll begin. The plantains are the way I like them – soft and sweet. Not mushy, or sugary just a pleasant, chewy sweetness that is matched by the savoury, hot sauce. Food with substance. The fish is nice. One of the nicer ways of having Mackerel I must say. The sauce has enough heat and spice to cut through the oily fish. The white flesh is gorgeous in contrast with its blackened skin. But by western standards, this fish is overcooked in parts. It changes character across its fishscape, from areas of tough (for fish), chewy flesh….almost reminiscent of chicken, to moist and juicy and just how fish should be. It isn’t over spiced, or under. Some salt brings out the tastes and the smoking heightens the nuances of flavor. The sauce is the tie that binds. That hold all things together. Without which, nothing is gained and everything is lost. I like lots of sauce. Or ‘Plenty stew’. Pidgin English. It is thick and flavourful, and lately the lady we buy from has begun to add texture with chunks of red onions…and I’m loving it. 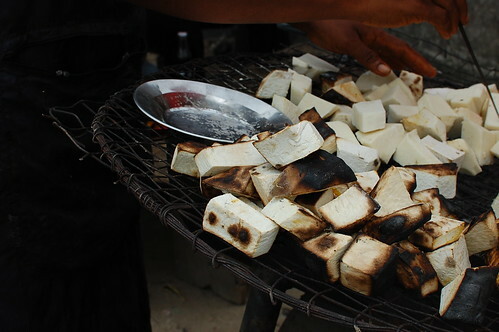 These days, more and more, people are making bole at home. The plantains are roasted in the oven or on the grill and a chunky sauce that’s more onions and peppers than tomatoes is served up on the side. A bit like my Nigerian stew but chunkier. And in the way of popular and well loved foods, real experts can be found and brought home, to cook up some. Like at a neighbourhood party we had back in December. 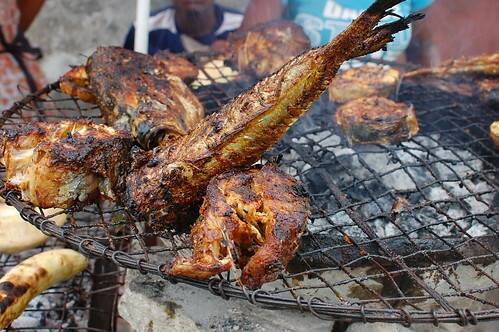 We enjoyed delish Bole, and Tilapia. And lots of great conversation. Stay well and lots of love. The journey continues.